Sometimes you just need a simple pasta meal! And in a jiffy. 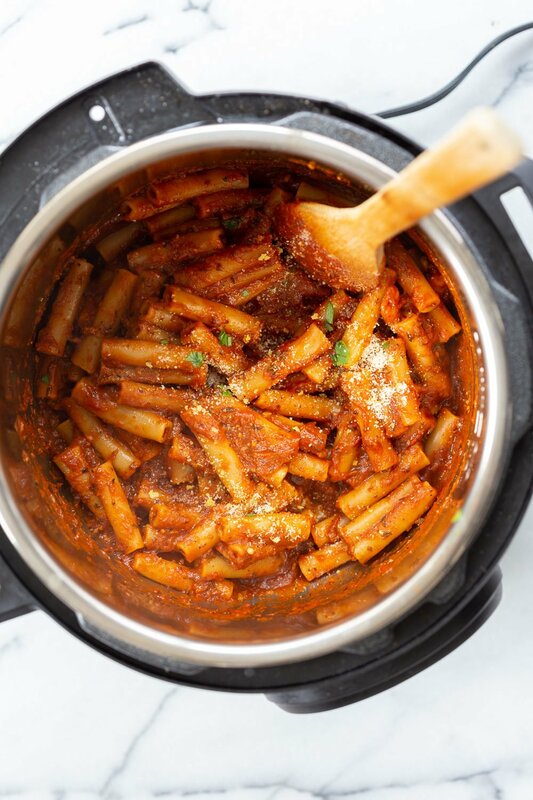 This Ziti with herbed tomato pasta sauce fits just there. Put everything in an Instant Pot, pressure cook and done. 20 minutes to a fabulous meal. Add some vegan parm, cashew milk or vegan mozzarella for creamier or cheesier flavor. Add some veggies in with the sauce, fresh herbs for garnish and serve with some crusty garlic bread. This Vegan Ziti comes together really quickly. 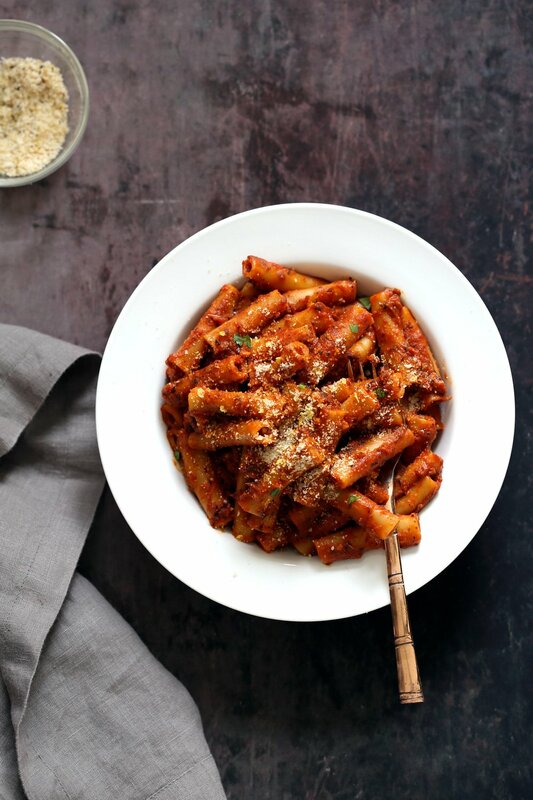 It has some amazing flavor from the gently toasted garlic, tomato sauce that gets cooked to a wonderful flavor under pressure, and the pasta that cooks right with it. 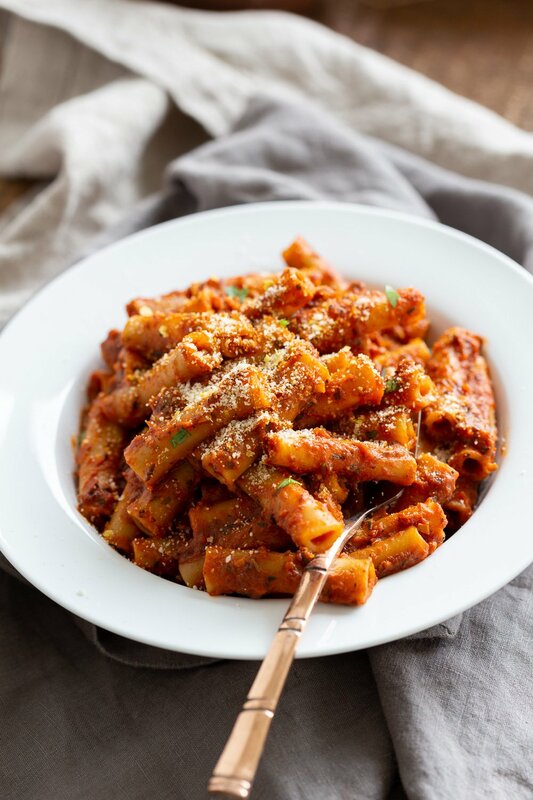 Sprinkle with some toasted breadcrumbs and vegan parm for a Baked Ziti kind of effect. 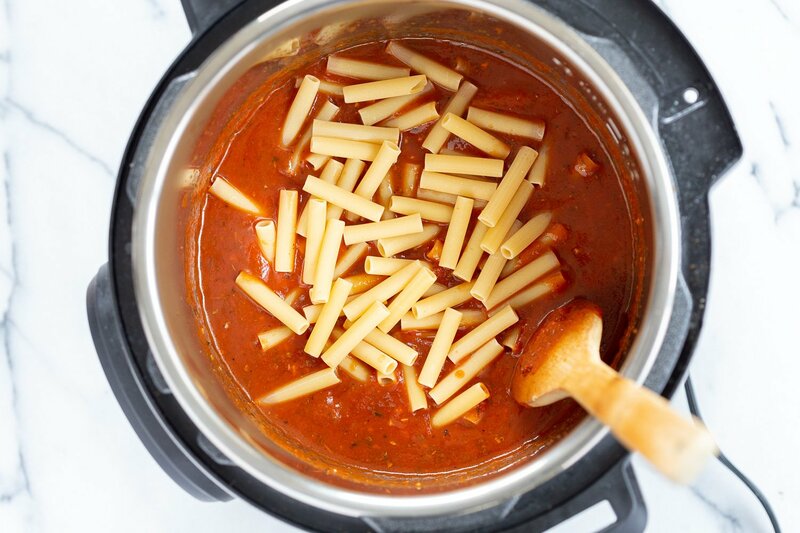 Saucepan instructions in notes and tips for cooking pasta in Instant Pot below. Pasta and tomato based sauces in the Instant Pot pressure cooker can easily end up with issues such as burn errors, uneven cooking etc. For a well cooked pasta, mix with the sauce really well, pressure cook time for pasta is a min or so more than half the time listed on the pasta package. Letting the pasta sit for a few minutes before release helps cook any unevenly heated portions. 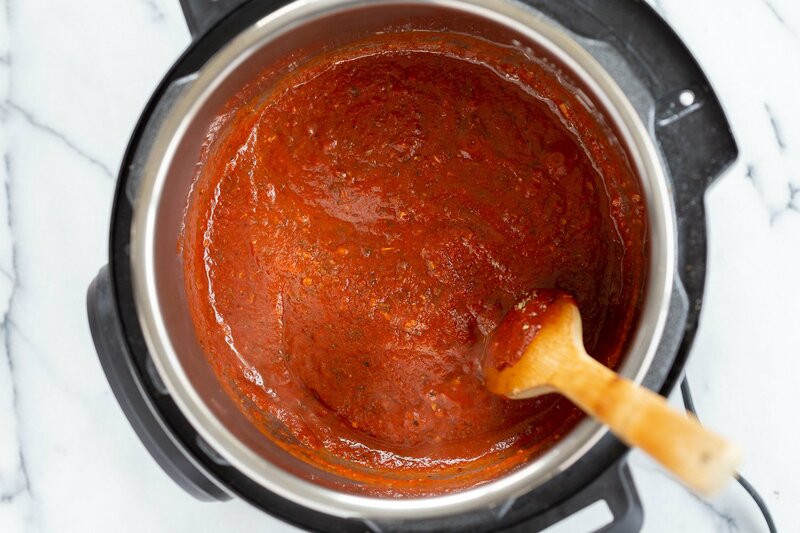 Tomatoes and tomato based sauces easily scorch the bottom of the pot during sauteing. The scorching or sticking at the bottom is usually the reason the pot gives a burn message under pressure. 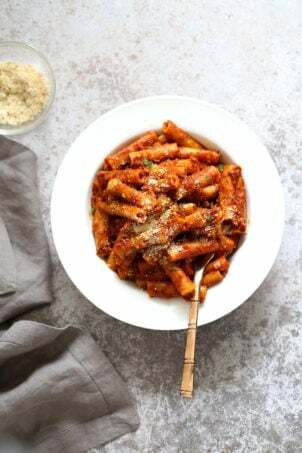 Try some things like using oil, using a smoother tomato sauce rather than chunky, switching off saute earlier to avoid scorching, mixing the sauce or ingredients really well so that nothing is stuck to the bottom, and use a bit more liquid if the sauce is too thick. I also find that cooking the on saute actually helps, as it allows you to see if there are ingredients that are going to scorch when under pressure. If they start sticking or scorching during saute itself, there are more chances of them sticking under pressure. 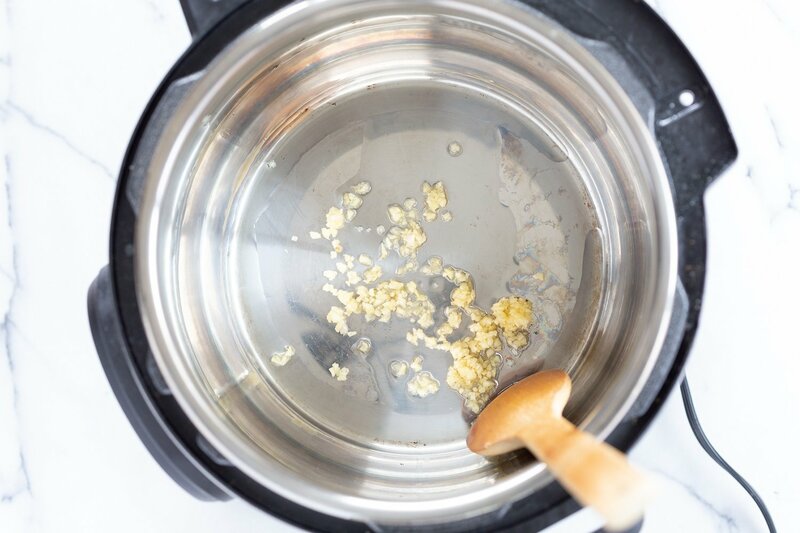 The heating up of the ingredients, allows the pot to come to pressure quickly, which also reduces the time the ingredients have to keep settling to the bottom. If you are adding veggies, add them finely chopped. 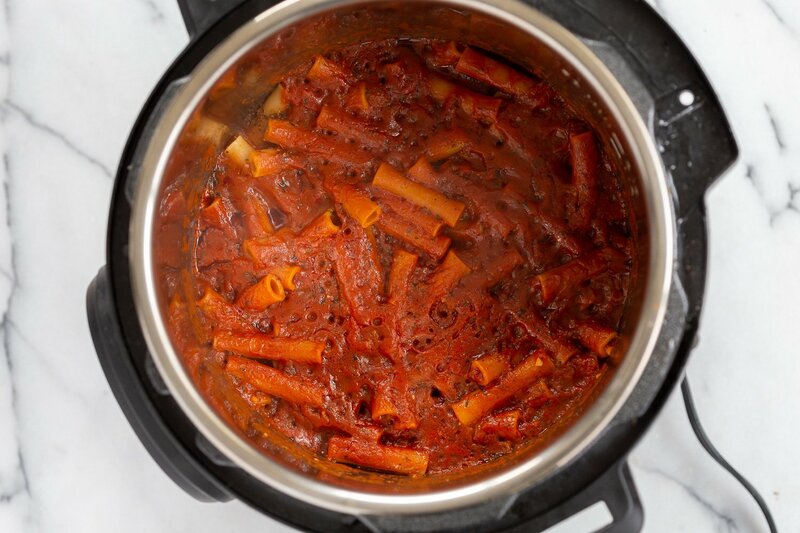 Instant Pot Baked Ziti with Tomato Sauce. 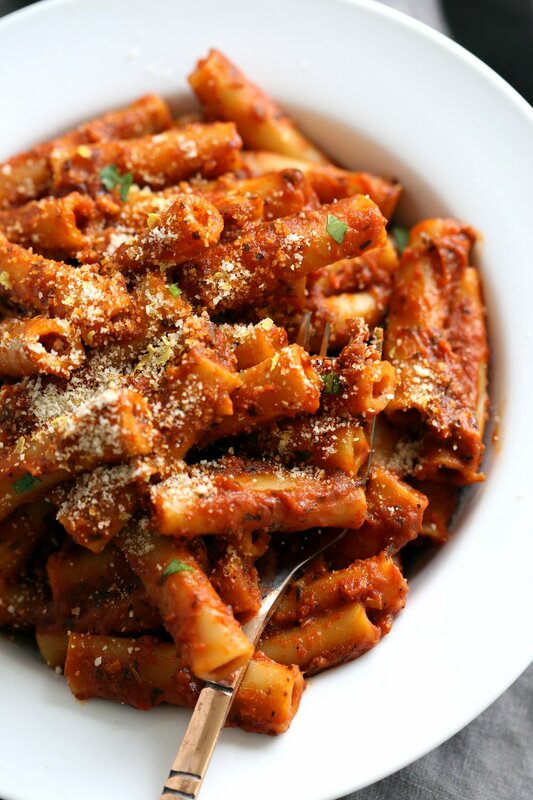 Date Night Quick Pasta with Ziti, sprinkled with vegan parm and fresh herbs. Vegan Ziti Soyfree Recipe. Easily Glutenfree, Nutfree. Add the tomato sauce, herbs, pepper flakes and salt and mix in. Switch off saute. Add pasta and water and mix well to dislodge any stuck bits. Press the pasta into the sauce so the pasta is well covered in the sauce. Close the lid and pressure cook for 6 mins. (4 to 7 mins depending on the pasta used). Quick release after 4 mins. Add white pepper, olive oil , vegan parm, or vegan mozzarella and mix in. Garnish with more parm and fresh herbs. For gluten-free, use glutenfree pasta. Saucepan: Cook the pasta according to instructions on the package and set aside. Heat a skillet over medium heat and follow step 1 and step 2 without any water. Simmer the sauce for 2-3 mins, adjust flavor and salt and fold inthe pasta. Add the white pepper, basil, vegan parm or vegan mozz and mix in. Cover, switch off heat and let sit for 3 mins for the flavors to meld. Garnish with more vegan parm or toasted breadcrumbs. This is super fast and very tasty. I used Banza chickpea pasta and turned out well. Hubby loved the flavor. This is great for fast weekday dinner. Go try it. I would love to send a friend the video of this recipe but as far as I can tell it’s only on Facebook. Could it be added here or on YouTube? Thank you, love your cookbooks! Love how quickly and simply this meal came together, added some onion and rosemary and marjoram to the herb mix. I’ll definitely have to try doubling the recipe to guarantee more leftovers.